Bangladesh has the dubious distinction of being the most densely populated country in the world and one of the poorest. Roughly 85 percent of its population lives in villages, where there is a frequent possibility of natural disasters such as floods, severe storms or tidal waves. Around two-thirds of the people live on agriculture and there is little industry. Illiteracy is at an unacceptable high; only 38.1 percent of the population, age 15 or older, can read and write. Of these, the ratio of males to females is 2:1. The per capita income is $380, which may not take account of lots of economic transactions in the countryside because they are barter transactions or do not enter the government statistics. On the plus side, despite the apparent economic misery, the people always seem tremendously interested in public affairs and eager to know what appears in the press or over the radio and television, even though only a small segment can afford a television set. The people are ethnically homogeneous, 98 percent of them speaking Bengali, which is the national language, mandatory in all government offices; English is understood by the elite and serves also as an official language. Most of the press as well as radio and television broadcasting is consequently in Bengali although the small English-language press — newspapers and weeklies — has an influence far out of proportion to its circulation numbers. The predominant religion is Islam (88.3 percent), with Hindus (10.5 percent) as the principal minority, adherents of Buddhism, Christianity and others account for 1.2 percent. Officially, the Republic of Bangladesh is a secular democracy with everyone above the age of 18, regardless of race, religion or gender having the right to vote. An amendment to the constitution adopted in 1988 established Islam as the state religion. Also in practice, Islam is supported by the government, which disallows any criticism of it in the media. However, despite the religious affinity with the Islamic world, culturally Bangladeshis feel closer to the speakers of the Bengali language in the Indian part of Bengal, sharing with them the rich cultural traditions manifested in literature, music and the arts. The press and media reflect such a love among the citizens of Bangladesh and regularly publish special articles and features on Bengali culture. 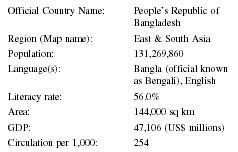 From August 1947 when the British carved out the two dominions of India and Pakistan until Dec. 16, 1971, the present area of Bangladesh comprised the Eastern wing of Pakistan, designated as East Pakistan. In the absence of genuine social, cultural and economic integration between the two wings of Pakistan, East Pakistan remained neglected and disgruntled as its cultural ethnic identity overwhelmed the common Islamic tie with West Pakistan, whose bureaucracy and military gave a disproportionately low representation to East Pakistanis, who numbered 55 percent to West Pakistan's 45 percent. The diverse differences came to the fore in December 1970 when in the elections to Pakistan's Constituent Assembly and provincial assemblies, Sheikh Mujibur Rahman, of the Awami League (AL), campaigning on a "Six-Point Programme" which included greater autonomy for East Pakistan, won 167 out of 169 seats there. The victory gave AL an overwhelming majority in Pakistan's Constituent Assembly and made Mujibur Rahman a legitimate contender for the position of Prime Minister of Pakistan. The total reluctance of President Yahya Khan and of Zulfikar Bhutto, leader of the Pakistan People's Party (PPP), to implement the electoral results led to Mujibar Rahman's declaration of a political strike (hartal) and the AL's assumption of power in East Pakistan. In March, 1971, Yahya Khan cracked down on Dhaka, East Pakistan's capital, massacring thousands and arresting Mujibur Rahman and detaining him in West Pakistan on charges of treason. The AL was declared illegal, an action which drove its leaders into India where in April 1971, they formed the Constituent Assembly of Bangladesh in Exile. They also formed the Mukti Bahini, a force composed of Bengalis in Pakistan's army and volunteers, as "freedom fighters" setting the stage for a civil war between the two wings of Pakistan. A million East Pakistanis crossed the border into India as refugees. Partly to resolve the problem of the refugee burden and partly to help the Mukti Bahini in its political goals, the Indian Army joined in the war against Pakistan's military forces beginning Dec. 16, 1971. Two weeks later, with the surrender of the Pakistani troops, the nation of Bangladesh was born. On Jan. 12, 1972, Mujibur Rahman, released from Pakistani jail, returned to Dhaka a hero to become the first Prime Minister of the People's Republic of Bangladesh. The Constituent Assembly of Bangladesh, consisting of those elected in 1970, adopted a constitution effective December 1972, providing for a parliamentary democracy based on four principles: democracy, socialism, secularism and nationalism. A series of natural disasters, economic problems and domestic disorder led to the proclamation of a National Emergency in December 1974 and the adoption of the fourth amendment to the Constitution enabling Mujibur Rahman to become the President, dissolve the Parliament and replace the AL with a new party, the Bangladesh Peasants and Workers League (BAKSAL). He banned all other parties. It was the worst year for fundamental freedoms, including freedom of expression. The government imposed restrictions on the press and the media which remained in place for the large part until the mid-1990s. The reaction to the emergency was swift. On August 15, 1975, some elements in the army assassinated Mujibur Rahman, some of his family and close supporters, and prevailed on Khondakar Mostaque Ahmed, a former minister of commerce, to become the President. He dissolved the BAKSAL, declared martial law but restored the parliament. He was soon replaced by an army general. The political position remained fluid moving from one point of instability to another until in l978, under the revised constitution, General Ziaur Rahman (Zia) became President and leader of a new party, the Bangladesh Nationalist Party (BNP) and abolished the martial law. His assassination in 1981 led to instability again until in March, 1982, Lieutenant-General Ershad assumed authority. He established the Jatiya party (JP) and by the end of the year became President, remaining in that position until 1990, when he was deposed, subsequently tried and convicted of a number of offenses and sent to prison. In February 1991, following elections, Begum Khaleda Zia, the widow of former president Zia, became the Prime Minister leading the majority of the BNP members in the parliament. In September, the constitution was revised. The country returned to a parliamentary system of government, ending 16 years of executive presidential rule. In early 1996, the press played a key role in persuading the BNP government, whose term of office had just ended, to hand over authority to a caretaker government in April and thereby set the stage for national elections in June. The media succeeded; the general election of June 1996 held by the caretaker government put a coalition government under the AL's Sheikh Hasina. The victory of the press in enabling a transition of government through the mechanism of a "caretaker government " led to the adoption of a constitutional amendment at the end of 1996. The "Caretaker Government Amendment" made it obligatory that, in future, all general elections in Bangladesh would be held by a neutral, non-partisan caretaker administration headed by the President. Accordingly, on July 13, 2001, Hasina stepped down as Prime Minister handing over the charge to a caretaker administration. The general elections of October 2001 held by the caretaker administration brought in a new government, this time under the BNP's Khaleda Zia as Prime Minister. The early history of the press in Bangladesh is inextricably linked to the Bengal presidency, which covered the present Bangladesh and the Indian states of West Bengal and parts of Orissa and Assam under the East India Company (until 1858) and thereafter under the direct British rule. Calcutta, being the capital of all the British Indian possessions, became a major center for newspapers and magazines. Looking narrowly at the history of the press in the area covered by the present Bangladesh, one readily sees the importance of Bangladesh's capital, Dhaka (formerly Dacca) as the second major center (after Calcutta) for the concentration of newspapers and magazines. Two of the earliest magazines in Bengali — Kabita Kushumabati and Dhaka Prakash —were published around 1860 in Dhaka. Over the following two decades, Dhaka published several newspapers in Bengali: Mahapap , Bangabandhu and Balyabibah . Lesser centers like Banshal published Gram Dut , BalaranjikaHitasandhani and Barishal Barta; Rajshahi published Hindu Ranjika . Also of note is the fact that a newspaper of great distinction on the Indian sub-continent, Amrit Bazar Patrika , was first published in Jessore in 1868. With the partition of the Indian sub-continent and the emergence of Pakistan in two wings — West and East — in 1947, East Pakistan began publication of two dailies: Purba Pakistan and the Paigam and a weekly, Zindagi . In the following year, the daily Azad and the morning News , which were published in Calcutta since 1936 and 1942 respectively shifted to Dhaka. Two more Bengali dailies, which grew into being the most important newspapers in Bangladesh — the Sangbad and the Ittefaq — began publication in 1950 and 1955 respectively while another daily, the Pakistan Observer in English started in 1948. The period around the birth of Bangladesh witnessed the birth of many new papers and magazines. Such include: Banglar Bani (1971), GanakanthaSamaj (1972), Janapada (1973), Bangabarta (1973) — all in Dacca; Andolan (1973), People's View (1970), Dainik Michiil (1972), Dainik Swadhinata (1972) — all in Chittagong and Daily Janabarta , Dainik Prabha and Tribune in Khulna. Statistics of number of newspapers and their circulation vary with different sources. According to the Editor and Publisher International Year Book 1999, there were 40 daily newspapers in Bangladesh, and the number of cities with competing newspapers is substantial. Dhaka, for example, is the home of 21 newspapers, four of which boast a circulation of more than 100,000. Five of Dhaka's newspapers are printed in English, and 16 in Bengali. The city of Chittagong prints seven newspapers — five in Bengali and two in English -— one with a circulation of more than 20,000; four with a 10,000; and two with 5,000. Khulna has six newapapers, one of which is printed in English. Four have a circulation of greater than 5,000. Jessore has three papers, all printed in Bengali; Rajshahi has two Bengali newspapers; and Dinajpur has one Bengali newspaper. Of these, the largest two dailies in Bengali — the Ittefaq and Dainik Inquilab — are published from Dhaka with a circulation of 215,900 and 180,140 respectively in 1999. The total circulation of the eight English language dailies was a little over 145,000; those published in Dhaka had a circulation of nearly 117,000. Although only about 10 percent of the total circulation of all newspapers, the English press is very influential because it is read by intellectuals, academics, sophisticated politicians and foreign diplomats. Many of its columnists enjoy an international reputation for their superior abilities in reporting and analysis. The newspapers suffered a major blow when most of them came under fire under the Emergency Regulations in 1974. In 1972, the Mujibur Rahman government took over the ownership and management of four daily newspapers and one periodical: Morning News , Azad , Observer , Dainik Bangla and Purbodesh . The government imposed severe controls over those which survived the onslaught. By 1997, following the return of the Awami League Party to power, the controls were relaxed though four publications still remained under the government-controlled trust. These were: Dainik Bangla , Bangladesh Times, weekly Bichitra and fortnightly Ananda Bichitra. Except for these, most of the newspapers in Bangladesh at present are entirely owned privately, mostly by limited liability companies. For years after its independence, Bangladesh needed massive economic assistance because of a series of natural disasters, governmental mismanagement and rampant corruption all of which hampered development. In the last decade or more, economic conditions have improved. The economy is market-based, but the Government owns all utilities, most transport companies, and many large manufacturing and distribution firms. A small, wealthy elite controls much of the private economy, but a middle class is emerging. Bangladesh needs industrial development and massive foreign direct investment, which is currently very low, concentrated in the gas sector and in electrical power generation facilities. Remittances from workers overseas in Saudi Arabia, Kuwait, United Arab Emirates, Oman, Qatar, Malaysia and Singapore enable the government to bridge the gap between exports ($5.1 billion) and imports $8.01 billion), for example, in 1998. The exports are principally in garments, jute and jute goods, frozen fish and seafood, with the United States being the best destination (33 percent), Germany (10 percent) and the United Kingdom (9 percent). Imports have been largely of machinery and equipment, chemicals, iron and steel, raw cotton, food, crude oil and petroleum. The principal trading partners in imports are India (12 percent), China (9 percent), Japan (7 percent), South Korea and Hong Kong each 6 percent. Foreign aid ($1.475 billion in fiscal 1996-1997) remains an important source of the much-needed foreign exchange; the external debt was an estimated $16.5 billion in 1998. Newspaper ownership and content are not subject to direct government restriction. However, if the Government chooses, it can influence journalists through financial means. Government-sponsored advertising and allocations of newsprint from the state-owned newsprint mills in Khulna are central to many newspapers' financial viability. At times, the government creates an "artificial scarcity" of newsprint and denies allocation or delays allocation of newsprint to certain newspapers, which are even mildly critical of the government. The Newsprint Control Order of 1974 entrusted the Ministry of Commerce and Foreign Trade as well as the Ministry of Information and Broadcasting with control over the production, consumption and distribution of newsprint. Government-sponsored advertising is the largest source of revenue, taking 50 percent of the space of the newspapers. In allocating advertising through the Department of Films and Publications, the Government states that it considers circulation of newspapers, implementation of wage board recommendations, objectivity in reporting and coverage of development activities. In the past, commercial organizations often were reluctant to advertise in newspapers critical of the Government due to fear of government or bureaucratic retaliation, however, this appears no longer to be the case. Under the State of Emergency regulations of 1974, most newspapers were closed down or regulated. At that point, the government itself took over some newspapers and prominent political weeklies. By 1997, most such restrictive regulations were removed except that four publications continue to be financed and managed by the government-appointed trust: Dainik Bangla . Bangladesh Times, weekly Bichitra and fortnightly Ananda Bichitra . Among the well-funded publication groups in the private sector are the Ittefaq Group and the Inquilab Group. The Ittefaq , which commands the largest circulation. was founded by the late legendary Tofazzal Hossain; it is now run by his son, who claims it is non-partisan and meant for all classes. Its non-partisan claims are sometimes questioned particularly because its editor/owner has been a minister in two governments. The financial independence of the other popular daily, Sangbad, is also well assured partly because of the support of the industrialist, Ahmadul Kabir. Article 39(1) of the Constitution provides for freedom of speech, expression and the press but Article 39(2) makes the enjoyment of these rights subject to "reasonable restrictions" in the interests of "the security. of the state, friendly relations with foreign states, public order, decency and morality in relation to contempt of court, defamation or incitement to an offence.". Numerous Acts inhibit these freedoms, most notorious in this respect being the Special Powers Act (SPA) of 1974, whose rigor was marginally lessened in 1991 by allowing bail for journalists and others arrested under that Act. The SPA made it an offense, punishable by five years' imprisonment and/or fine "to print, publish or distribute prejudicial reports." Journalists were required to identify all sources of information and authorities were given draconian powers to seize documents and newspapers, to ban publications and to search premises. Section 99A of the Code of Criminal Procedure made any printed matter, defamatory of the country's President or the Prime Minister, an offense punishable by imprisonment from two to seven years. The worst years for legislation limiting the freedom of the press were 1973 to 1975, following the brief honeymoon with Prime Minister Mujibur Rahman, who had emerged as the nation's hero after the birth of Bangladesh. Besides the SPA, a State of Emergency declared in 1974 empowered the government to ban any foreign periodical. By June 1975, 20 dailies and all political weeklies were banned except those taken over by the government: Dainik Bangla , Bangladesh Times , weekly Bichitra and fortnightly Ananda Bichitra . The Press Council Act of 1974 ostensibly entrusted the Press Council (PC) with preserving the freedom of the press. Its responsibilities included responsibility for devising a code of conduct for maintaining high professional standards. In practice, the PC would help the press to avoid a conflict with the government through self-censorship. The PC Act held the PC responsible for protecting the fundamental rights of the citizens against any "unscrupulous or irresponsible" newspaper or journalist. The Act did provide the right of the journalists to confidentiality of a news source. The PC has no powers to take action against the government for transgressing the freedom of the press, nor does the government consult the PC before taking action against a newspaper or a journalist. The Government's human rights record has remained poor in many significant areas. It has continued to commit serious abuses, although it respected citizens' rights in some areas. The Police committed a number of extra-judicial killings, and some persons died in police custody under suspicious circumstances in the 1990s. Police routinely use torture, beatings and other forms of abuse while interrogating suspects. Police frequently beat demonstrators. The government rarely punishes persons responsible for torture or unlawful deaths. It continues to arrest and detain persons arbitrarily under the Special Powers Act (SPA) and Section 54 of the Code of Criminal Procedure. A silver lining of the situation is that the higher levels of the judiciary display a significant degree of independence and often rule against the Government; however, lower judicial officers tend to toe the line of the executive, and are reluctant to challenge government decisions. Despite such restrictions, self-censorship and governmental abuse of power, the press, numbering hundreds of daily and weekly publications, provides a lively forum for a wide range of views. The free spirit of the Bengalis prevails. While most publications support the overall policies of the government, several newspapers report critically on government policies and activities, including those of the Prime Minister. All publications are subject to Press and Publication Act of 1973, which requires four copies of each issue to be sent to a "designated government agency." While the government categorically denies the existence of censorship, in practice, papers are "guided" by the advice and briefings of the Principal Information Officer of the Ministry of Information and Broadcasting as well as by the External Publicity Division of the Ministry of External Affairs. The President's Council of Advisors controls the newspaper editors informally. In general, criticism of economic policies is more likely to be tolerated than sensitive political issues. Foreign publications are subject to review and censorship. Censorship most often is used in cases of immodest or obscene photographs, perceived misrepresentation or defamation of Islam, and objectionable comments about national leaders. In October 2001, the BNP Government banned the popular Calcutta-based, Bangla-language magazine Desh . The Government alleged that the magazine was offensive to the country and its citizens. A government Film Censor Board reviews local and foreign films, and may censor or ban them on grounds of state security, law and order, religious sentiment, obscenity, foreign relations, defamation or plagiarism. In general, the Film Censor Board looks kindly at the Bangladesh-made films, occasionally suggesting some cuts. However, the Board has habitually banned the screenings of several imported English-language movies for their pornographic content. Video rental libraries provide a wide variety of films to their borrowers, and government efforts to enforce censorship on these rental films are sporadic and ineffectual. The Government does not limit citizens' access to the Internet. Journalists and others are potentially subject to incarceration when criminal libel proceedings are filed by private parties. Members of Parliament from the ruling party have, in the past, filed separate criminal libel suits against several newspapers after articles were published that the politicians viewed as false and defamatory. The journalists in all cases received anticipatory bail from the courts, and none of the cases moved to trial. Sedition charges remained pending, and those persons accused remained on bail. In November 2000, a new sedition charge (there was another sedition charge already pending against him) was filed against an editor, Bahaudin, for publishing a parody of the national anthem mocking the Prime Minister. When the police arrived at Bahauddin's residence to arrest him, he was not there, so they arrested his brother, Mainuddin, instead under the PSA and, therefore, not eligible for bail. Mainuddin was not charged; after 16 days he was released. Charges against editor Bahauddin remain pending in both sedition cases. Virtually all print journalists practice self-censorship to some degree, and commonly are reluctant to criticize politically influential personalities in both the Government and the opposition; however, some journalists do make such criticism. Many journalists cite fear of possible harassment, retaliation, or physical harm as a reason to avoid sensitive stories. Violent attacks on journalists and newspapers, and efforts to intimidate them by government leaders, political party activists, and others frequently occur. Violence against journalists has increased since 2001. Political parties and persons acting on their behalf conducted attacks both on media offices; individual journalists were targeted for their unfavorable news reporting. These crimes largely remained unresolved and the perpetrators, often identified by name or party affiliation in press reports, have not been held accountable. Attacks by political activists on journalists also are common during times of political street violence, and some journalists were injured in police actions. To start with, East Pakistan, as Bangladesh was then known, had very poor telecommunications. Between 1959 and 1963, the first 100 KW medium wave and short wave transmitters were installed in Dhaka in order to improve communication between the two wings of Pakistan separated from each other by over 1,200 miles. There were relaying stations in Chittagong, Sylhet, Rangpur, Rajshahi and Khulna. The 1971 war for the liberation of Bangladesh destroyed most of the facilities particularly in Khulna. Immediately after liberation, the government established the Bangla Betar Radio (BBR) with eight regional stations. In June 1975, Bangladesh opened its first earth satellite radio station at Betbunia, 140 miles south-west of Dhaka with $8 million from the Canadian International Development agency. Television began in 1964, thanks to Nippon Electric Company as part owner of the pilot TV project. By the end of the 1960s, there was a satellite station operating from Chittagong along with two relay stations in Khulna and Rajshahi. By 1970, there were 35 hours of weekly telecasts, mostly in Bengali. Following the liberation of Bangladesh, Mujibur Rahman nationalized TV Bangladesh (BTV) Corporation with the government as the controlling stockholder and Nippon Electric as a major stockholder. The BTV has expanded considerably since then with its headquarters in the Rampura sector of Dhaka. The Betar Radio (BR) has eight radio stations in Dhaka, including one for overseas service. There are FM facilities in Dhaka, Sylhet, Chittagong, Rajshahi, Rang-pur and Khulna. 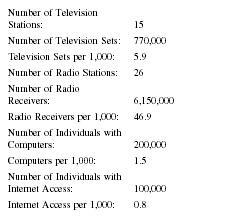 As for television, there were 15 broadcast stations in 1999 with an estimated 1.5 million sets in 2001. Programs are aired nationwide and to the other countries of South Asia, South and Southeast Asia, Middle East, Europe and the US. The BTV covers 95 percent of the population with relay stations in Dhaka, Rangpur, Mymensingh, Noakhali, Satkhira, Sylhet, Khulna, Natore, Rangamal, Chittagong, Cox's Bazar, Jenaidah, Thajurgaon, Brahmanpura and Patunkhali. Together, the BR and BTV have a workforce of nearly 4,000 and are responsible to the Parliamentary Committee for their functioning. In practice, they are virtually controlled by the Ministry of Information and Broadcasting. In the early 1990s, Cable TV was introduced. It became quickly popular and was availed of in more than one million homes with about 2,000 cable operators having an average of 200-250 subscribers, mostly in Dhaka and Chittagong. In 2002, they charge an average $3 or about 175 takas per connection. All operators need a license from the BTV, costing them an annual 25,000 Takas in the four main cities and 10,000 Takas in other urban centers. In 1991 and 1996 elections, both the principal political parties —the AL and the BNP— called for a free, national and democratic broadcasting system under an independent authority. On Sept. 9, 1996, the AL government appointed a 16-member committee to recommend measures and authorize private TV and radio. In 1997, the committee submitted its report. The US Department of State's Report on Human Rights, 2001 observes that the Bangladesh Ministry of Information and Broadcasting thought the recommendations for privatization were "unrealistic." The first measure toward privatization was, however, taken in March 1999, authorizing privately owned Ekushey TV to go on air by the end of 1999. It has agreed to follow the existing censorship guidelines. The government owns and controls virtually all radio and television stations with the exception of a few independent stations, such as Ekushey Television (ETV) and Radio Metrowave. The activities of the Prime Minister occupy the bulk of prime time news bulletins on both television and radio, followed by the activities of members of the Cabinet. Opposition party news gets little coverage. As a condition of operation, both private stations are required to broadcast for free some government news programs and speeches by the Prime Minister and President. In 1996, a government committee recommended measures for authorizing autonomy for radio and television broadcasts. On July 12, 2001, Parliament approved two bills granting autonomy to state-run Bangladesh Television (BTV) and Bangladesh Betar (Bangladesh Radio). Even with passage of these laws, the public still believes that there is no real autonomy for BTV and Bangladesh Radio. Government intrusion into the selection of news remains a pervasive problem. Many journalists at these stations exercise self-censorship out of regard for what they feel were the government's wishes. 1996: Free and Fair elections; press plays a major role in the proposal for a pre-election care-taker government. 1997: The Government disbands the state-controlled trust which was in charge of publishing four important newspapers since 1974. 1999: Private television ownership permitted. Ahmed, Q.Z., Development News in the Newspapers of Bangladesh , (unpublished doctoral dissertation), Washington, D.C., Howard University, 1998. Anam, M. Walking the Tightrope: Press Freedom and Professional Standards in Asia , AMIC, 1998. Anwar, M.T., "Bangladesh: Fewer 'Black Laws"' in Press Systems in SAARC . AMIC, 23-27. Singapore: 1994. APT (Asia-Pacific Telecommunity), The APT Yearbook 2000 . Bangkok and Surrey. Billboard Publications. World Radio and TV Handbook 2001 . Amsterdam: 2001. Bhuiyan, S.I. and Gunaratne, S.A.. "Bangladesh" In Gunaratne, S.A..Ed. Handbook of the Media in Asia . Sage, 39-66. New Delhi: 2000. Editor & Publisher. Editor & Publisher International Yearbook 2000 . New York. French, D. and Richards, M., Eds. Contemporary Television: Eastern Perspectives . Sage. New Delhi: 1996. Gunaratne, S.A., Hasim, M.S.., and Kasenally, R. "Small is Beautiful, Information Potential of three Indian Ocean Rim Countries" Media Asia . 24, 188-205. 1997. Lent, J.A. "Bangladesh" Newspapers in Asia: Contemporary Trends and Problems . Heinemann Asia, 428-441. Hong Kong: 1982. "Media Monitors in Bangladesh," In Venkateswaran, K.S., (Comp)., Media Monitors in Asia. AMIC, 12-16. Singapore: 1996. Moslem, S., "Bangladesh," In Asian Communication Handbook , A. Goonasekara and Holaday, D., Eds., 5-15. AMIC, Singapore: 1998. Network Wizards, Internet Host Survey : Online. Salam, S.A., Mass Media in Bangladesh: Newspapers, Radio and Television , Dhaka, South Asian News Agency, 1997. Ullah, M., "Bangladesh," In Communication Development and Human Rights in Asia , Hamelink, C.E. and Mehra, A., Eds., AMIC. Singapore: 1990. UNESCO, Statistical Yearbook . Paris: 2000. World Association of Newspapers (WAN)., World Press Trends . World Association of Newspapers. Paris: 2000. I am researching the "out of home" Billboard market in Bangladesh both static and digital. Excellent study. But what about current status? Do you have any link to get updated information?